The Goal Keeper is the last line of defence. They guard the goal circle and the defensive third and must stop the Goal Shooter from scoring. They have to stay alert so they can collect rebounds off the post and intercept passes. Goal Keepers are also responsible for taking throw-ins from the goal-line. They are often tall and physical players who are prepared to fiercely protect their goal post! For more information about this position view the Goal Keeper Position Guide video. The Goal Defence patrols the defensive third, the goal circle and the centre third. Their main job is to stop the opposition from scoring and to get the ball out of the danger area! The Goal Defence has to keep a close eye on the other team's Goal Attack. They must have good skills of anticipation so they can block passes and get the ball out to their own attacking players. For more information about this position view the Goal Defence Position Guide video. The Wing Defence can go into the centre and defensive thirds, but NOT in the attacking third or the goal circle. Their main job is to stop the ball reaching the opposition's goal circle. They must intercept passes and feed them back to the attacking areas. As well as getting the ball forward they have to mark the opposite Wing Attack. The Wing Defence must be focused and good at controlling the ball. For more information about this position view the Wing Defence Position Guide video. Centres are able to move in the whole court, with the exception of the goal circles. They have to help out in defence and attack. But they are mainly relied upon to shift the ball away from the defensive area into attack. Centres also restart the game each time a goal has been scored. They do this by making a pass from the centre circle. The Centre is the engine of the team so they have to be quick and creative with their passing. Centres are normally the swiftest player on the court which means they are often among the smallest. For more information about this position view the Centre Position Guide video. 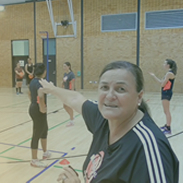 The Wing Attack is the key playmaker of the netball court. It is their job to create as many goal scoring chances as possible by passing the ball to the shooters. The Wing Attack can move in the attacking and centre third BUT not in the goal circle or the defensive third. The Wing Attack has to have solid passing and collecting skills. They also need good footwork and the ability to open up space on the court. For more information about this position view the Wing Attack Position Guide video. The Goal Attack's primary role is scoring and setting up goals. They can play in the centre third, the attacking third and the goal circle but NOT the defensive third. The Goal Attack's main duty is to feed the Goal Shooter so they can fire the ball into the net close to the post. But if the defenders are marking the Goal Shooter then the Goal Attack will often have a shot from nearer the edge of the goal circle. The Goal Attack must have both strong passing and shooting skills. For more information about this position view the Goal Attack Position Guide video. The Goal Shooter's main job is simply to score goals. They are allowed in the attacking third and the goal circle BUT nowhere else on the court. The Goal Shooter must have sharp shooting skills. They have to be able to react quickly, dealing with passes and rebounds. Goal Shooters have the steadiest hands on the court and are often among the taller players. For more information about this position view the Goal Shooter Position Guide video.